Sharpen skills such as parallel parking, merging, and passing with any plug-and-play computer steering wheel set. Become comfortable enough with driving to remember to routinely look around, check blind spots, use mirrors, turn signals and headlights, and be aware of your speed. You can make smart driving a habit. Ready to drive? Take a look through our Web site and learn more. Watch the video, read below, and then check out the Gallery for SimuRide photos. What is the SimuRide Home Edition? The SimuRide Home Edition (HE) is driving simulator software for the home computer. It is meant for beginner drivers who are studying for their driver’s license. The program builds good habits to rely on later in a real driving situation. It was designed to help new drivers practice in addition to practicing in a real vehicle. Driving the SimuRide HE does not require parental supervision or a learner’s permit, does not use fuel and cannot be damaged in collisions! 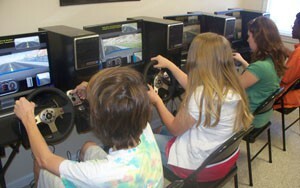 By practicing on a simulator, students can calmly pick up necessary skills. More practice makes everyone safer. There is no sequence and students are free to practice driving wherever they want. It teaches students to use an automatic, passenger vehicle with or without a small trailer attached. The software is similar in design to the SimuRide Professional, but it is simplified and runs on a single home computer monitor. By pressing buttons on the wheel or keyboard, users can turn to look to their left, right, monitor blind spots and directly behind their virtual vehicle for approaching traffic and obstacles. SimuRide is also a driving Simulator for the people with special needs. 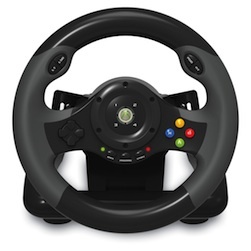 Our SimuRide can be used also with the popular Xbox Racing Wheel EX2. Since this particular wheel offers accelerator and brake (analog) push buttons in the steering wheel, it can be used with our SimuRide HE to learn and practice driving by people who have some limitation in their legs and have to use their arms to accelerate or brake the vehicle. The SimuRide HE conditions students to use their rear-view mirrors, headlights and turn signals. Nervous drivers can get a feel for the steps they have to take when starting a vehicle, turning and parking. When they drive a real vehicle, they will spend less time remembering what they have to do. What skills can you practice with Home Edition driving simulator? The SimuRide HE was designed to learn and increase driving skills, especially if access to a practice vehicle is limited. 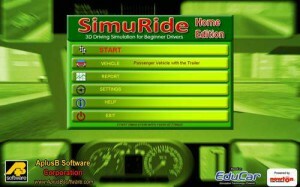 Students should practice with SimuRide HE before and during practice in a real vehicle. Young children can play on the program in advance and licensed drivers can improve driving skills like driving with a trailer attached. SimuRide HE is great for preparing for a driver’s test. For written test preparation, take a look online for the US & Canada Driving Test software by AplusB Software. Not all students have access to a practice vehicle, time to practice, or a driving school. Parents or owners of vehicles for practice limit their use when fuel or risk of accident is a large concern. Using SimuRide HE maintains a great amount of practice without using fuel and keeps drivers safe. SimuRide is a great addition to studying in a school or from a book; it is much more interesting, fun and engaging. The SimuRide Home Edition is now available in our online store for $75. Minimum graphics card – Nvidia GeForce 7600 GT or any other card that has G3D Rating minimum 393 and Rank maximum 363. For some older computers we provide 3D Software Accelerator and few additional functions (implemented in the SimuRide HE software) that make the SimuRide HE more compatible. Mac Computer users can run SimuRide by installing a Windows emulator. An emulator is a program that allows Mac OS computers to run Windows-based programs. SimuRide HE Manual (Please Read before installation): click here. Please watch our 8 minutes video (listed above) before you start installing the SimuRide HE into your computer! This video is vital and explains in detail how to install and setup the simulator program and the steering wheel with pedals. 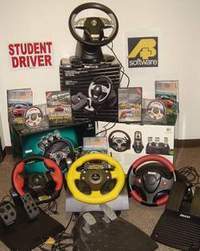 You have to go to START/All Programs/A+B Software/Steering Wheel Configuration, to be able to use your steering wheel. 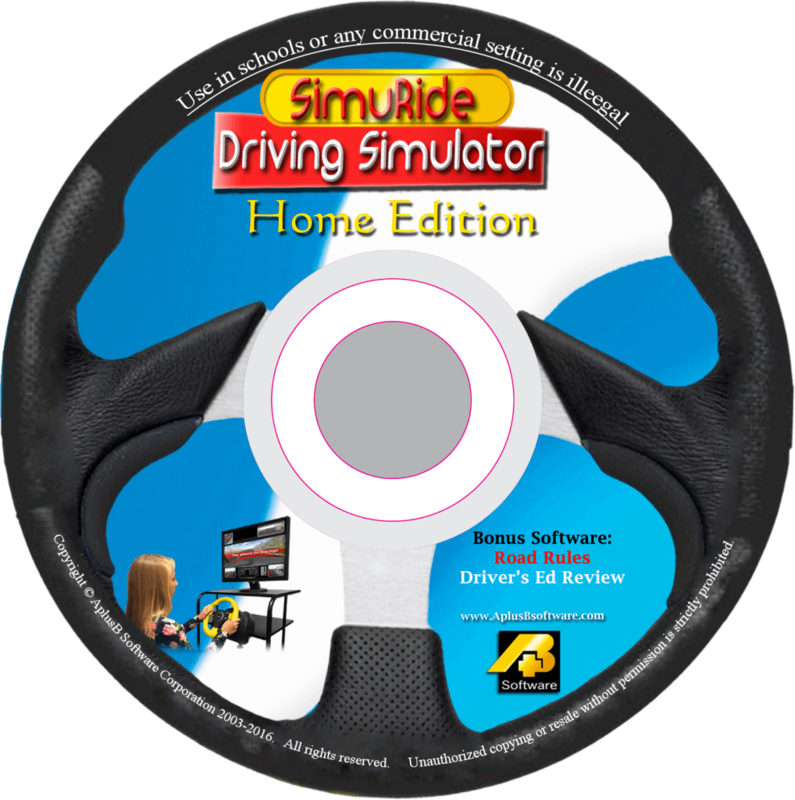 The SimuRide Home Edition Driving Simulation Software is for right and left hand traffic, to be used at home. For schools and any commercial purpose we offer SimuRide Professional Edition. Home Edition is intended for home use only, this is not approved for any type of business. 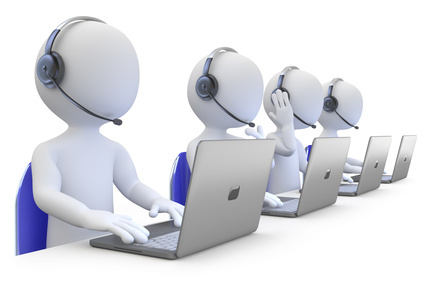 This software generates warnings if it is being used in schools or businesses that it is an illegal practice and asks the user to contact authorities. Looking to study the CDL Test questions? Our CDL Commercial Driver’s License Manual 4th Edition, is educational software on CD designed for truck, bus, and forklift operators. A modern, flexible approach to Beginner Driver Education.